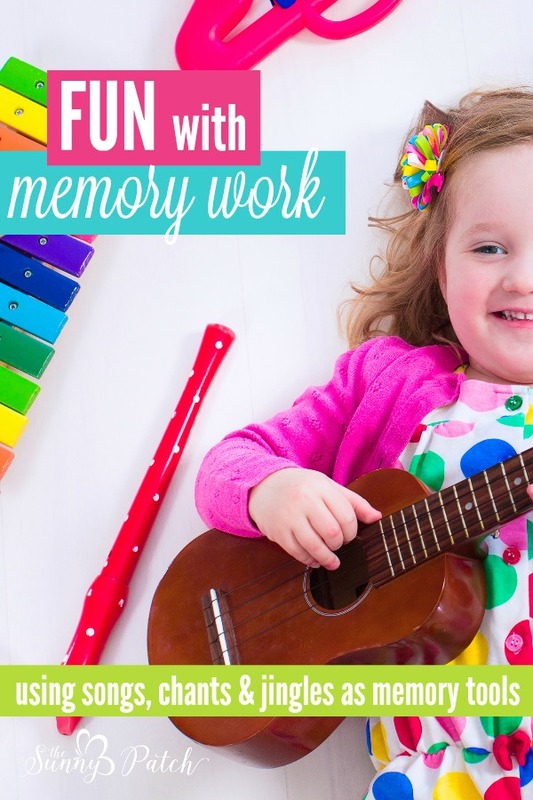 This month we are focusing on the fifth principle - Songs, Chants & Jingles and how we're using songs for memory work. I am almost 40-years old and still remember the song I was taught in grade school to memorize the 50 states (you can find it on YouTube). I think that's reason enough to prove that using a silly song can help you memorize anything! Songs, chants, and jingles are perfect tools to help young kids memorize facts and information easily (and it's fun!). Why use songs & chants or even memorize anything? What's the point of all those songs and chants? Kids love them! It's a lot more fun to sing a grammar chant than it is to just recite a list. Why memorize lists & facts? What's the point of memorizing random lists of facts or people? According to Susan Wise Bauer in The Well-Trained Mind, it creates pegs for learning. If you memorize a list of pharaohs while studying ancient Egypt, your kids will have plenty of 'aha' moments, as they relate specific events to certain people. One caveat - I believe that memorized facts and information should be tied to what kids are currently learning. I don't think memorizing a list of random facts just for the sake of memorization is very beneficial. It's all about making connections between what they've memorized and what they are learning. When children make that connection on their own, between something they've memorized and what they are currently learning, they really own that learning and internalize it. When we, as teachers, connect the dots FOR them, they may still learn but it isn't quite the same. Can you remember any point in your education where you made some deep connection between two pieces of information without having someone spell it out for you? It becomes a part of you in a way that learning by lecture just can't do. As homeschool parents, we can use these tools to encourage our children to make those connections on their own. We provide the tools and resources (and often the voice via reading aloud or hands as they dictate to us) but we need to give them time to make those connections themselves. Songs and chants are one simple tool in our toolbox that can aid our children in beginning to make those connections. It's really very easy to come up with your own (or get your children to help). Choose a children's song you like, for example, Twinkle, Twinkle Little Star' and add your own words or facts to the tune. Get your kids to help - they'll have fun and learn even more if they help create the songs and chants. I encourage you to watch Dr. Perrin's presentation as he delves deeply into the topic (and he has some good tips about using songs, chants, and jingles with older students as well). You can find the complete series of videos at Classical Academic Press. Don't forget to visit Sara at Classically Homeschooling to read her thoughts and helpful advice for using songs, chants, and jingles in your homeschool.